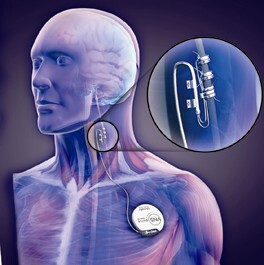 Vagus nerve stimulation (VNS) in humans refers generally to stimulation of the left vagus nerve at the cervical level using the NeuroCybernetic Prosthesis (NCP, Cyberonics, Inc., Houston, TX, U.S.A.) system. This equipment consists basically of three parts: 1) the implantable, multiprogrammable bipolar NCP pulse generator, which is similar to a cardiac pacemaker in size and shape; 2) two helical electrodes, which are wrapped around the vagus nerve and are linked to the pulse generator by a bipolar lead; and 3) a programming wand linked to a computer running programming software, which allows noninvasive programming, functional assessment (device diagnostics), and data retrieval. 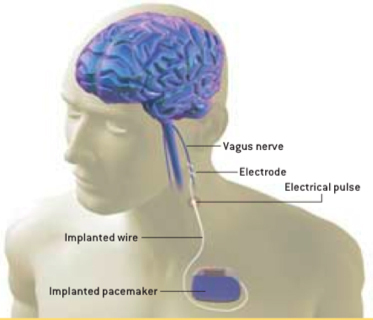 The pulse generator is implanted in a subcutaneous pocket in the left chest wall, whereas the electrodes are attached to the vagus nerve, made accessible by an incision in the neck. Through a subcutaneous tunnel, the electrodes are linked to the pulse generator. The system delivers electrical impulses at frequencies between 1 and 30 Hz, at 0.25 to 3.5 mA, with a pulse width varying from 130 to 1000 microseconds at variable on-off times. Vagus nerve stimulation has recently gained considerable interest as a potential treatment of relative drug-resistant major depressive episodes.